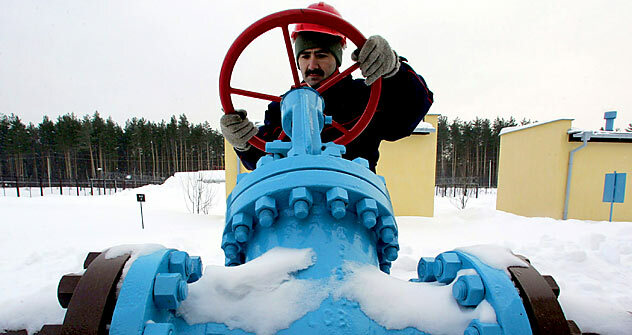 Russian gas major Gazprom struggles with increased demand as Europe suffers through a cold snap. Russian gas monopoly Gazprom has admitted that it cannot satisfy Europe’s demands for gas. “Requests from countries outside the CIS are being met in accordance with the contract at the moment. We see that the volume of requests has risen, while we have an approved schedule of gas supplies to Western Europe,” said Gazprom Deputy CEO Andrei Kruglov. “The supplies are being delivered according to schedule, but Gazprom is unable to supply the additional volumes requested by our partners in Western Europe,” he said. Kruglov also confirmed that the company indeed reduced its deliveries by 10 percent over the weekend, but said that volumes had now been restored. Due to the abnormally cold weather in Western Europe, EU countries have asked Russia to increase its supply of natural gas. Operators in Italy, Slovakia, Poland, Austria and Hungary estimate the shortage of gas at about 30 percent. European Commission Spokesperson Marlene Holzner said countries were currently compensating for the fuel shortage by using their own reserves or switching to liquified natural gas. Europe has accused Gazprom of reducing the deliveries, but the Russian company insists that it has stepped up its supplies. According to Gazprom CEO Alexander Medvedev, Russia’s gas exports to Europe currently stand at 180 billion cubic meters of gas per year. Experts say the situation is not yet critical. At the moment, there is no direct damage to consumers, said Dmitry Alexandrov, an analyst at investment company Univer. However, a problem could arise if prices on the spot market rise above Gazprom’s contract prices, forcing some consumers to buy the difference at market prices. In this case, Gazprom would have to somehow make up for the discrepancy if it is responsible for the shortage, Alexandrov said. Obviously, Gazprom has an inadequate transport capacity during peak times, noted Mikhail Korchemkin, head of East European Gas Analysis. “After Nord Stream was put into service in autumn 2011, Gazprom’s potential export capacity reached 210 billion, but in reality, it cannot export even the 180 billion cubic meters mentioned by the company’s CEO Alexander Medvedev,” Korchemkin said. Prime Minister Vladimir Putin came to a similar conclusion. At his meeting with Deputy Prime Minister Igor Sechin and Gazprom management, Putin said that the current situation only underscores the need to put the second stage of the Nord Stream and the South Stream into service as soon as possible.